A few weeks ago on the facebook page, I asked if you had tried the 'grow celery from the the root' trick. Well, it got tossed to the chickens, but thankfully I had another bunch of organic celery in the fridge. I cut the bottom off the bunch and planted it in the ground. Believe it or not... it's working! It's regrowing from the root that I stuck in the ground. To do this trick, friends, you need to make sure you are using organic celery or celery from a trusted farmer that does not apply growth retardants or pesticides, etc. 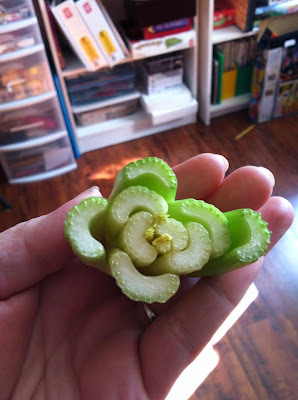 Regular celery from the grocery store has a retardant that will not allow it to regrow, just as they do with tomatoes and such... you can't save seeds from grocery store vegetables or fruits. So, it's as easy as it sounds. Cut the stalks off and leave the bottom intact as seen above. Stick it in some good soil and watch! So exciting! I think I need to start another couple of bunches. Shannon LOVES celery! Give it a shot and let me know how you fare. Thanks for sharing that! I never would have thought that worked!